We supply a small range of industrial relays and contactors, mostly for switching mains voltage loads, from various manufacturers including Omron and Finder. See the Relays & Contactors page on our Webshop for specific models that we stock. 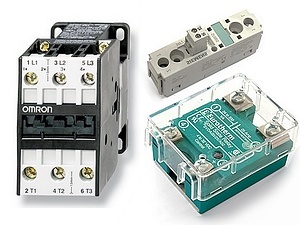 We offer a range of solid state relays (SSRs) from manufacturers including Omron, Eurotherm and Siemens. SSRs allow for fast switching of loads and have a long life. Since they have no moving part, unlike traditional mechanical relays, they produce much less electrical interference and no audible noise. They can be controlled using temperature controller with an SSR output, see our range of Temperature & Process Controllers. See the Solid State Relays (SSRs) page on our Webshop for specific models that we stock. We also offer accessories including mounting adaptors and heatsinks.